The World Book Day Extravaganza 2015! 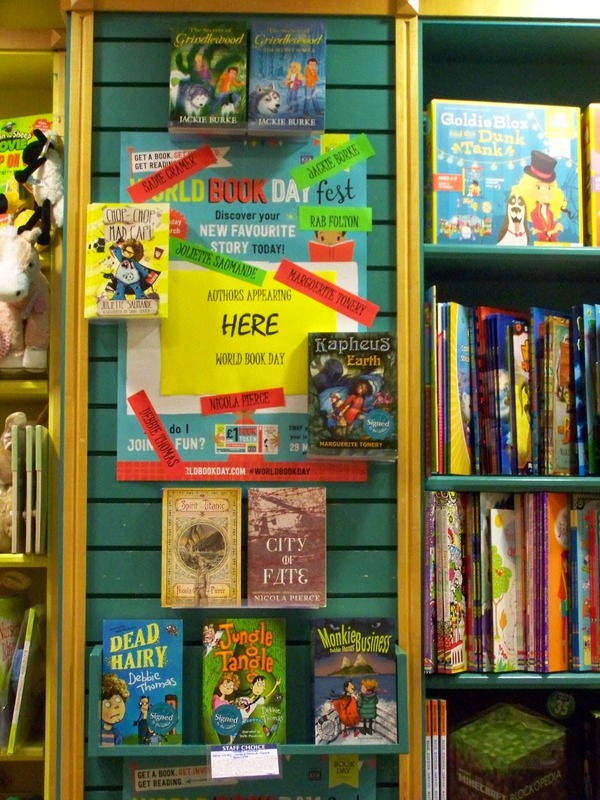 In just another weeks' time, the Galway Dubray Books World Book Day Extravaganza will be upon us! Yes, another year of fantastic author events for the local kids is happening again, where I get to host a plethora of events and bask in the excitement and joy of reading. I'm at that moment where I'm fine tuning events, double checking the bookings and (fingers crossed) making sure all will go well on the day. 4. Broken Strings by Maria Farrer, edited by Helen Thomas (Scholastic). 6. Cowgirl by Giancarlo Gemin, edited by Kirsty Stansfield (Nosy Crow). 12. Mars Evacuees by Sophia McDougall, edited by Sarah Hughes (Egmont). 13. True Fire by Gary Meehan edited by Sarah Lambert (Quercus). 14. Trouble by Non Pratt, edited by Annalie Grainger & Denise Johnstone-Burt (Walker Books)15. Leopold Blue by Rosie Rowell, edited by Emily Thomas (Hot Key). 16. Valentine Joe by Rebecca Stevens, edited by Rachel Leyshon (Chicken House). As you can see, there is a strong representation of YA novels in this years list. And I have to say, it contains some of my favourites from the last twelve months; A Room Full of Chocolate, Alfie Green and the Magician's Secret, Dandelion Clocks..... Very exciting list! The short list will be announced on 4th of May. The list for the Carnegie and Greenaway Awards have been announced today. But before I post about that I want to congratulate the winners of the Ezra Jack Keats Foundation Awards for New Writer and New Illustrator. The Ezra Jack Keats Foundation is responsible for many programmes in support of children, schools, public libraries....any institution or people dedicated to highlighting excellence and diversity in childrens literature. To this end, the Ezra Jack Keats Awards were established to honour writers and illustrators whose work continues in the spirit of Keats. Ezra Jack Keats created a number of wonderful and innovative picture books that broke barriers and crossed social boundaries in its' celebration and depiction of the world of childhood. 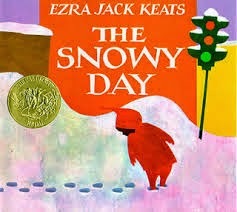 His 1962 classic, The Snowy Day, shows the world of children in the tenements and empty lots on a day filled with snow. There is loneliness, friendship, joy, wonder and courage. Keats believed that children of colour had the essential right to see themselves as heroes in picture books and that all children deserved to see different ethnic backgrounds living and learning the same way the world over. 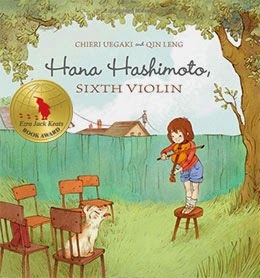 The Ezra Jack Keats Award for New Writer goes to Chieri Uegaki; a Japanese-Canadian author who Hana Hashimoto Sixth Violin. Hana signs up for a talent show, inspired by her grandfather a violinist. While only a beginner, Hana battles her self-doubt and stage fright and lets her imagination set her musical gift free. The Ezra Jack Keats Award for New Illustrator this year goes to the only and only Chris Haughton. Chris uses of colour and design combine with few words to create dramatic, joyful picture books that transgress language barriers to delight children (and adults!) of all nationalities. His latest, Shh! 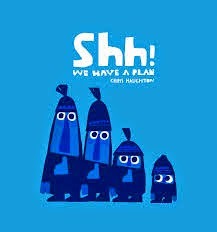 We Have A Plan is pure delight in blue, as a band of hunters seek to capture a bird, with very unexpected results. February is here now. (Happy St Bridgets Day, by the way.) January flew past (thank goodness). For the next couple of weeks, I will be very busy organising the annual World Book Day Extravaganza that I have been hosting for 10 years now at Dubray Books Galway branch. This is my favourite event(s) of the year, as I do so look forward to seeing all the young faces starting their reading lives. If I am a small part of that, I really feel something important has happened in my life. (Seriously...so joyous and fulfilling.) But more about WBD later. In the last two weeks, I did something so simple, and yet, I feel so very important. So, in the last two weeks, I did something to delight myself, and two different schools in my local area. Both schools are in the same situation. After many discussions and much locational shifting around in the school buildings, they have gotten the go-ahead to have a school library. The problem being, they have no funds for stocking it with books. In talking to the teachers in question, I had happened to say, "I have books." And we were off.... One local primary school and one local secondary school received boxes full of books. 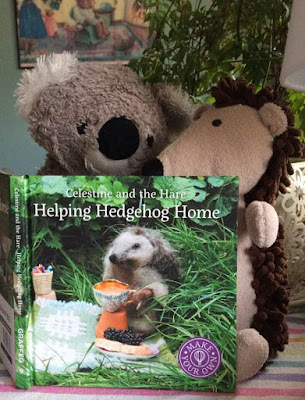 I my work, I receive proof copies (which I hang on to until the book has been published...don't worry, publishers), multiple copies of books, and then there's the books that I can't house (not enough shelves) and books I have inadvertently bought 2 of. I'm sure you bibliophiles out there know the story. So I thought, why not give them to the schools? They have shelf space, but no books. I have books, but not enough shelf space. And children of all ages NEED school libraries. I think sometimes we take it for granted that there will be school libraries, but with economics and the curriculum and the entire educational process being what it is, this is sadly not the case. We don't realise the absolute urgency of a school library in a childs' life. Here's one thing I think we have to keep in mind.... For some children, a school library is the only place they will ever have exposure and access to books and literacy. It sounds crazy, I know; but it's true. Some children are never taken to a local public library. They are never taken into bookshops. They are not exposed to books in the home. The only place they will have books is the school library. So, with that in mind, I am always delighted to give whatever books I feel I can give to the schools for a library. What I would like you all to consider is your local school. Do they have a library? 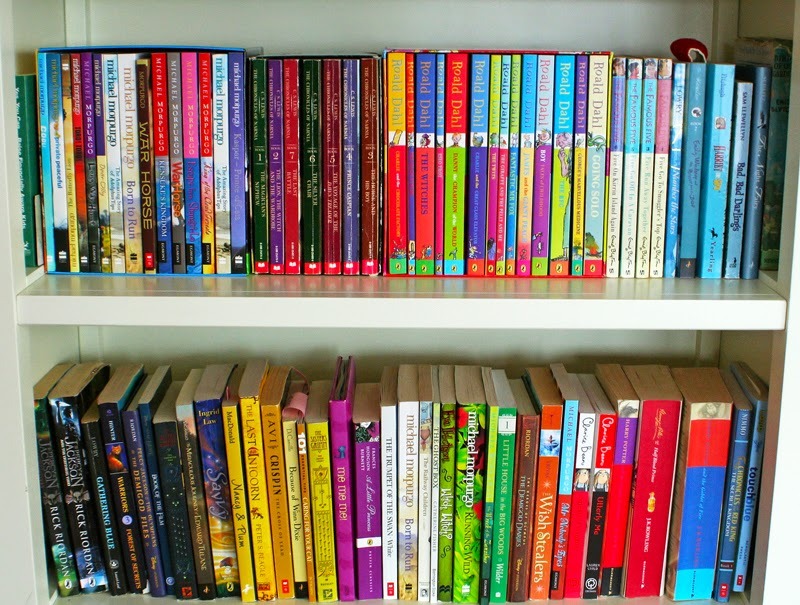 Could you afford to donate some of your books to them? Nothing beats the feeling i get when I walk through the schools' doors and hear a child call out; "Oh, wow! It's the book lady!!!"